It was time for an intervention. 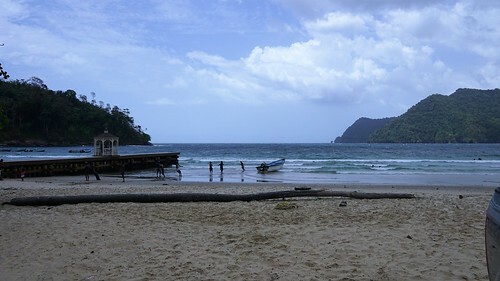 So I headed to Maracas Bay, a place of memories and where I could think. More importantly, it’s a place I don’t have to think. The drive up from South Trinidad was without event, a meditation in it’s own right (and some new exercise for the newer pickup) – and the North Coast Road a pleasure as I went through the gears until I came behind someone whose use of brakes was… mildly annoying. I found a spot between two coconut trees, and eyed the trees for dry nuts. They’re usually picked clean, but until you’ve seen what a falling coconut does to a vehicle, you don’t truly understand the peril. All clear. And, without hesitation, into the water. It’s cool. Cold. It’s early in the morning – 8 a.m. – so the water’s latent heat hasn’t risen from hours in the sun. It’s quiet on the beach at this hour. A few people bathe nearby, but not too near. Trudging in, the cold water licks it’s way upward even as the waves come in higher on the upper body. A decision has to be made. A dive, going under the waves, feeling it rush across your skin, through your hair. The sound of the wave rolls behind you, and you feel the pull of the next. Hold your breath. Feel the wave pass. Surface. And you’re staring at the horizon, the little annoyances of life beginning to rinse off. It would be a long day to get rid of them all- the lies that you’ve heard, the excuses, the relegation to some sort of beast unworthy of their thought. The time spent dealing with the ashes and dust of other people’s mistakes, their demands, their fickle wants, their implicit selfishness inflicted on others around them. Everyone wants to organize their sock drawer, few actually wear socks. And it washes away as I stare at the horizon, occasionally plumbing the depths on this side of the beach where the boats swing in the water. It strikes me that as a boy, I stared at the same horizon and my goal was to see what was beyond it – and here I am now, having seen what is there. It was magical then, a sense of wonder, a sense of escape as I grew older – to go beyond that horizon. I went well beyond it, and while there are places I will never see, those places that I have seen I have truly seen. I know how people live there, I have eaten in their kitchens and even my own there. I have seen them dance and sing, and I have heard their frustrations and felt them myself to an extent when I was there – wherever there was. I have seen the beaches, the forests, the deserts, the swamps, and I have seen all four seasons. And I have seen things I never expected to see, like the Aurora Borealis, or Mt. Fuji, or… so many other places and things. And in each place, there is a horizon with someone wondering what is beyond it, but trapped in the bubble others made, little man made prisons that are large enough for a soul to survive but inadequate for it to truly draw breath. Something hits me. It’s a plastic Solo bottle. I uncap it to fill it partially – the orange scent rises – closing the cap, 1/4 full, it easily sails to the waves before crashing to the shore when I throw it. Damned litter everywhere. How this beach has changed over the years. Despite the broken cousins of R2-D2 on the shore across the bridge painted in garish cheap colors, litter finds its way into the water that was once pristine. The use of those bins is as alien as my description. I encounter more bottles washing in, a blue plastic bag filled only with sea water – probably the former home of the plastic bottles. Humans are a plague. Some people wander around doing ‘cleanups’, but that’s not sustainable. 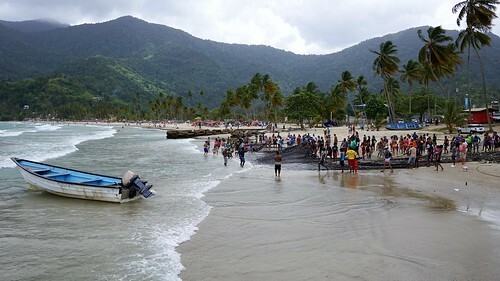 I think about the Trinidad and Tobago property tax, an attempt to make money, and how simply charging people who litter with exorbitant fees would probably bring in more money. A Sisyphean task. That rinses away, too, in time. The sun presses upward. It’s 11 a.m. – an underwater swim to one of the boats, then back. I’m reminded that I am no longer 16. Or 21. Or 23. In fact, I’m no longer 44 numbers. Fortuitously, there are infinite more, though I know I have probably seen more than half of the number I will see. That’s life. Empty promises, glass ceilings with sharp stone floors, the misplaced rendezvous, being unimportant to some while being too important to others – it’s all life. The lies and deceits of others continue washing away. You cannot lie to yourself in the ocean. It will simply not let you – it will kill you otherwise. Hunger. I decide to walk to the places on the more popular side of the beach. Wandering past the blaring and distorted chutney music, where Puncheon rum is going down faster than sobriety, across the sharp stoned area where the children are playing…. “Go, children, play on the sharp stones while we drink rum! What could possibly happen?”…. I cross the bridge. The little riverlet that leads to the beach has some rubbish in it – less than I expected, more than I would want to see. It’s the dirty little secret someone with a brain would have put a net across, but those with brains in civil service are forced to remove them during working hours so as not to interfere with the status quo. I see the new white chairs- the signs for rentals. There are rows of these plastic lounge chairs, congealed with an odd combination of tanning oil and sunblock in the proportions of the colors of the people who use them. Women in a fashion show of their own makeup, perfect hair and makeup, speak among themselves. The wind blows the mixture of perfumes my way. A confused bouquet, an olfactory disaster reminiscent of the skivvy houses in Okinawa – where the jobs of the women are easily seen by the underwear on the lines during the day, only here that is not the case. Here, they are simply strutting to be seen. Maybe. I have no time to go ask, and it’s probably better that way. I smirk to myself as I continue on, watching the newer culture of the beach. People stare at their phones, people getting drunk, everyone looking very trendy – in that, they all pretty much look like each other from a distance. A sea of people of the same mindset. That’s what a culture is, where it ends up dressing the same, speaking the same, and largely saying the same things – right or wrong, largely indifferent. Shrimp and Bake at Asha’s. The line for the ‘best’ at Richards is longer than my patience will allow for, so I order a shrimp and bake at Asha’s, load it with spicy mango and hot pepper sauce -they claim it is very hot. ‘Very hot’ north of the lighthouse, I suppose. The shrimp is more flour than meat, the bake paltry, but I am hungry and it fills me. I walk back, feeding my empty Red Solo bottle into a stray cousin of R2D2. People try to sell me things. 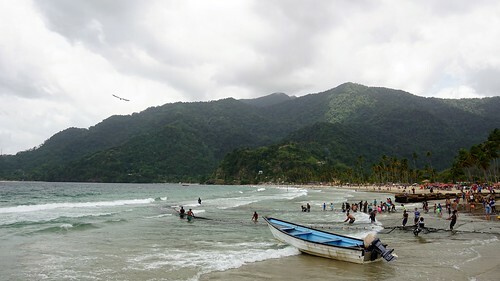 The calabashs were attractive, but I don’t need things… that I don’t need… and if everyone can get one simply by coming to what has become the most popular beach in Trinidad, then it’s not worth having. Of course, you should buy one, because his stuff is nice. I’m just a minimalist. I don’t want to have to worry about a calabash I won’t use. Neat rows of cotton candy are also being walked around the beach. Necklaces, wrist bands, all hand made of course. I wore similar things 30 years ago. It’s good to see them making a comeback, but I know that jewelry has a tendency to break off of me. Back to the water. To the depths. I can tell it’s almost time to go as people begin imposing in my area. 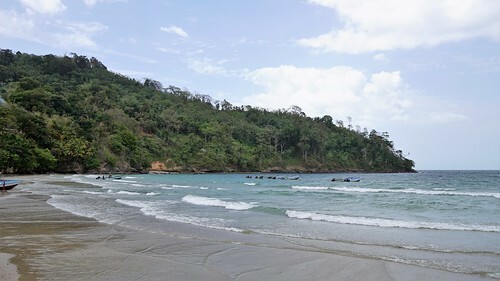 One starts speaking to me, telling me he’s from Penal, and how someone paid him $700 to come up here, that he’s staying sober – only a beer every now and then – and providing them with food and everything for their excursion. An entrepreneur servicing people without vehicles, or who choose to drink rather than drive. Not a bad thought. I think to ask for the father of a woman I once dated from Penal, but decided not to open that can of worms. A child runs up to help, encouraged by the adults, and starts pulling too. They call to others on the beach of the white lounge chairs, and a crowd begins to form. It grows larger, pulling at the net of fish until it is ashore. And the fishermen literally give away their livelihood, unlike when it happens in Mayaro. People are rushing for bags to put fish in.